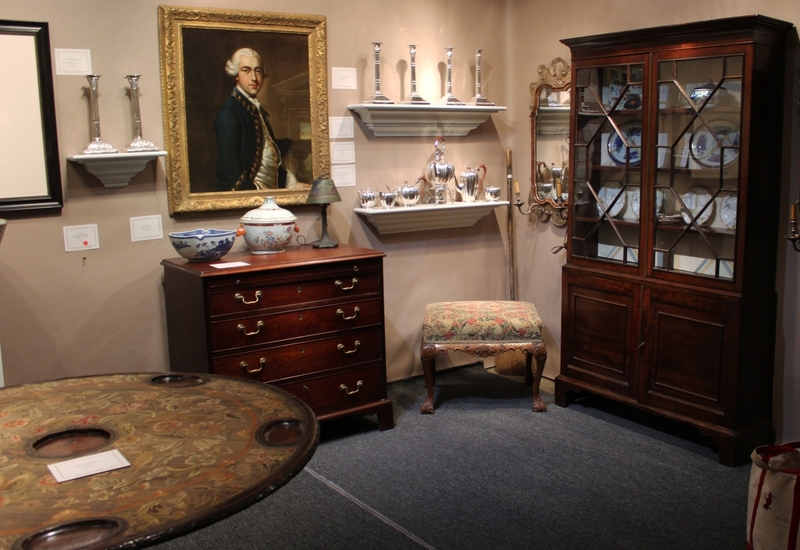 One of the sales made during the show from the booth of Beck’s Antiques, Fredericksburg, Va., was the Eighteenth Century redware olive oil jar shown on the left. 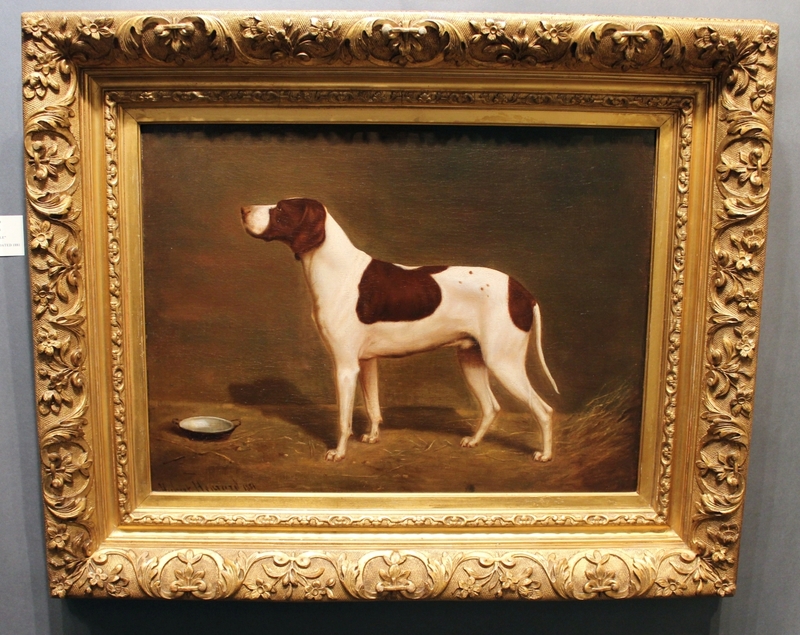 It is virtually identical to one that belonged to George Washington and Bill Beck sold it to Mount Vernon. 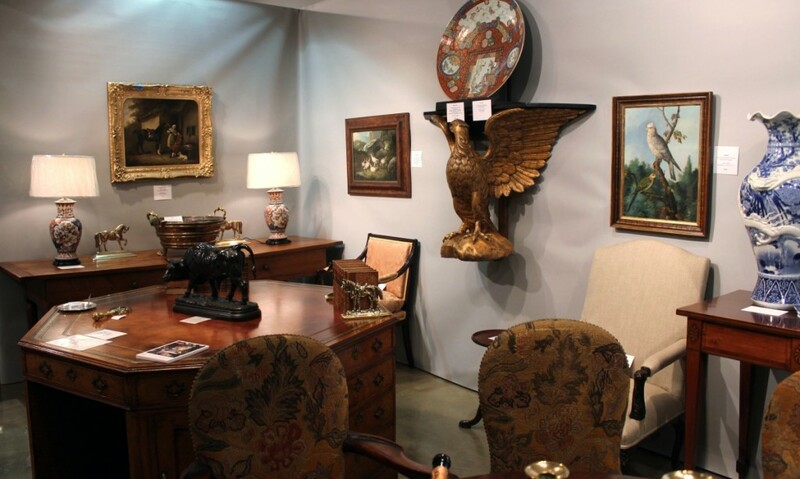 WASHINGTON, DC — The government might have been shut down, but nothing could stop the Washington Winter Antiques show from taking place January 10-13 at the Katzen Art Center on the campus of American University. 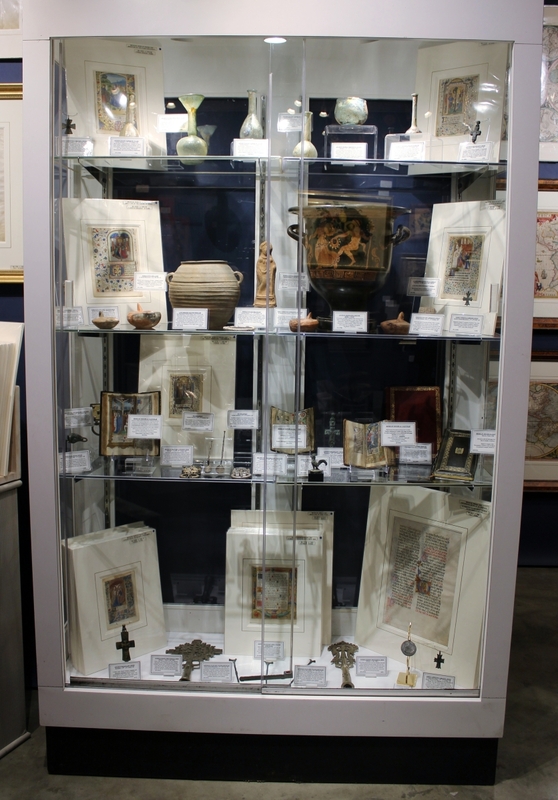 Founded in 1954, the annual event is the second oldest charitable antiques show in the United States and is now in its 64th year. 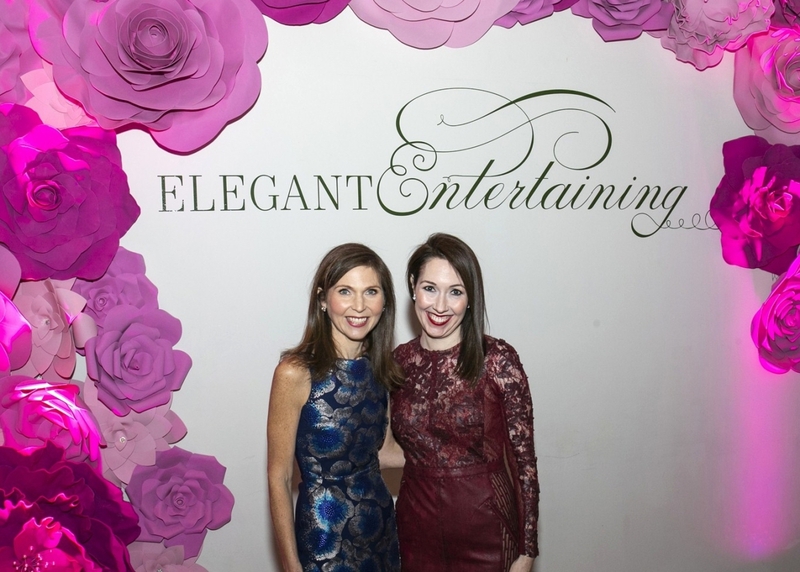 The show is the inaugural event for the Washington winter social calendar and patrons were not deterred by chilly temperatures, turning out enthusiastically for the opening night preview party and the first two days of the fair. The sizeable winter storm that moved into the area in the middle of the afternoon Saturday and continued through the early hours of Monday morning dumped nearly a foot of snow in central DC and considerably affected attendance, though some patrons made it to the show on Sunday and a few dealers reported sales even up at the show’s closing. The storm notwithstanding, many dealers reported the trend in buying was more cautious, when the spirit of buying might have been more accurately described as “I need to think about it” instead of the “I’ve got to have it now” attitude perceived in previous years. Some attributed this to uncertainty, whether caused by politics or current events, which was not helped by the government shutdown that was in effect during the show. 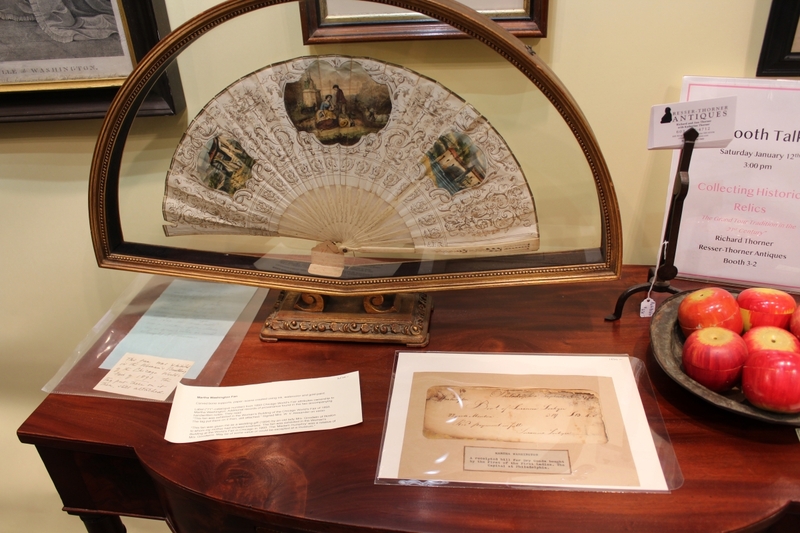 The theme of this year’s show was “Elegant Entertaining” and George Washington’s Mount Vernon provided the loan exhibition of objects that would have been used by the family when they entertained. 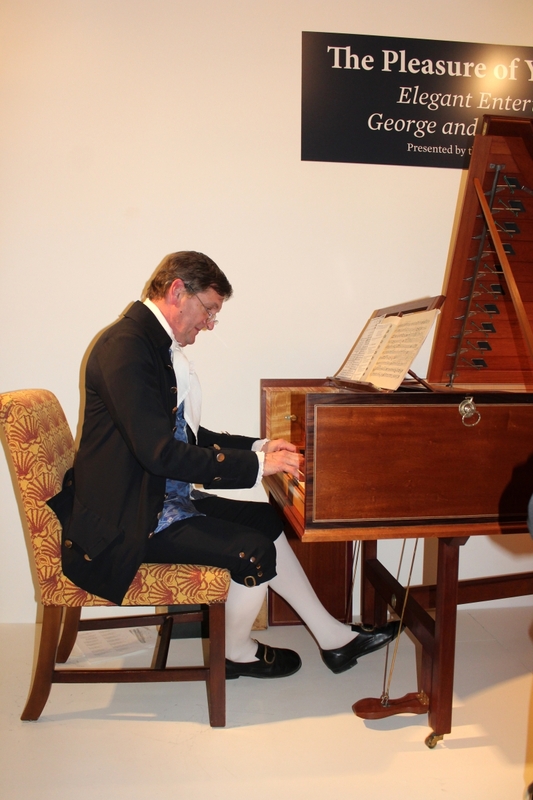 A costumed musician played a replica of Nelly Custis’s harpsichord for the delight and amusement of patrons during the opening night gala party and a table at the entrance to the loan exhibition was set with reproduction blue and white porcelain similar to what the Washington family owned. 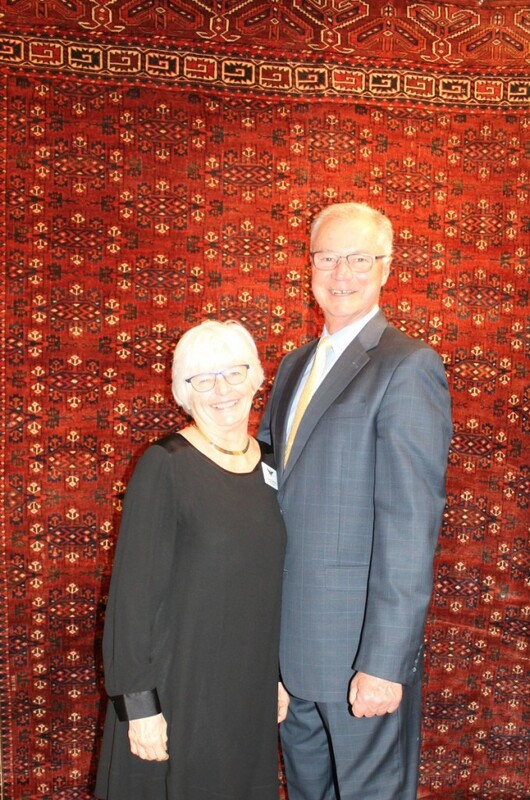 Show manager, Karen DiSaia, and her husband, Ralph, oversee the show masterfully, in addition to selling rugs from their inventory. Oriental Rugs, Ltd, Niantic, Conn.
Six dealers were new to the show: David Bell Antiques, Washington, DC, specializing in modern art and design; Silver Art by D&R, Baltimore, Md., and Marseille, France, featuring primarily French silver and other objets d’vertu; print dealers Dinan and Chighine, London; Guaresco Gallery, Washington, DC, focusing on Nineteenth and Twentieth Century paintings and sculptures; The Silver Vault, Woodstock, Ill., emphasizing English, American and Continental silver from the Eighteenth, Nineteenth and early Twentieth Centuries; and Resser-Thorner Antiques, Manchester, Vt., the first dealer at the Washington Winter Show to specialize in documents, ephemera, militaria and historical Americana. 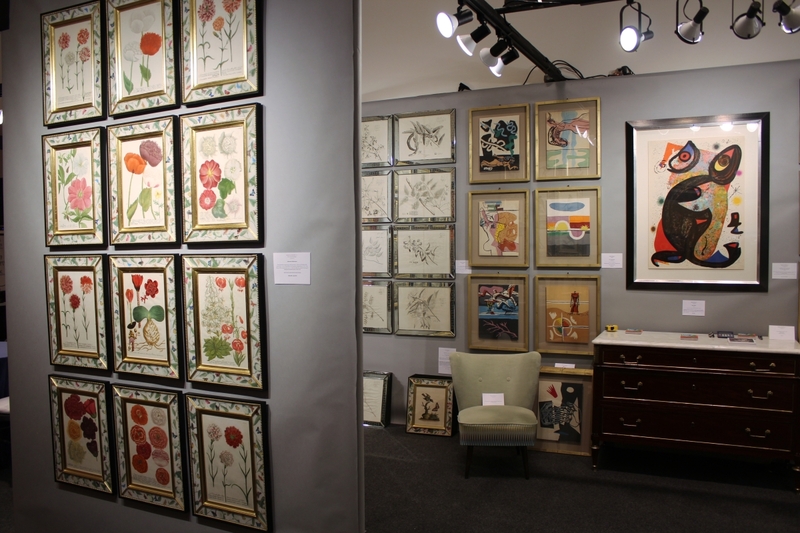 Returning to the show after a hiatus were Imperial Fine Books and Oriental Art, New York City and Carlson & Stevenson, Manchester Center, Vt.
Furniture sales began on opening night and continued through the show. Taylor Thistlethwaite, Thistlethwaite Americana, Alexandria, Va., said he had sold an early Baltimore chair on opening night and halfway through the preview party, a red sold sign was prominently displayed on a set of ten gray painted chairs, comprising two armchairs and eight side chairs, with Period to Mod, Brennan and Mouilleseaux, Briarcliff Manor, N.Y.
Period to Mod, Brennan and Mouilleseaux Antiques, Briarcliff Manor, N.Y. 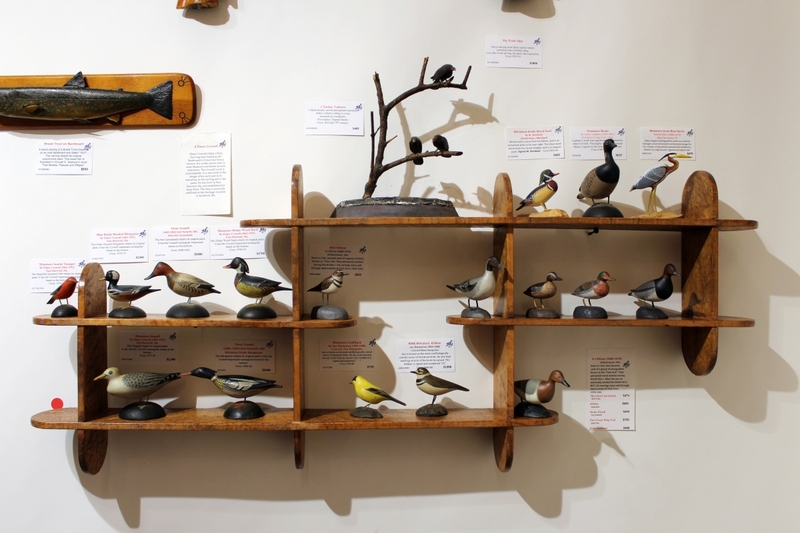 Selling two of the three pieces of furniture he brought to the show was a pleasant surprise for A Bird in Hand Antiques’ Ron Bassin. 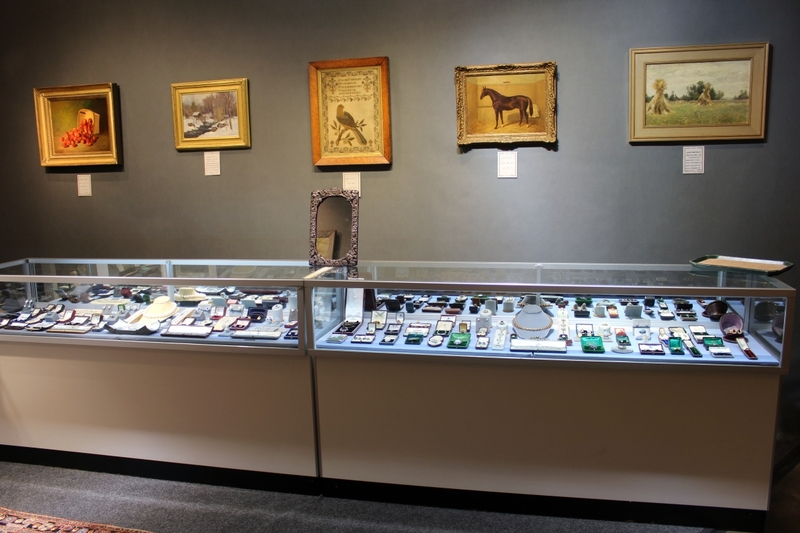 In addition to furniture, the Florham Park, N.J., dealer sold other things, including two Grenfell mats and a nice Hudson River sandpaper painting. He said his best sales were to a Harvard graduate who bought every pig he had in the booth, a total of four items, including a folk art sow trade sign and some ceramic pig banks. 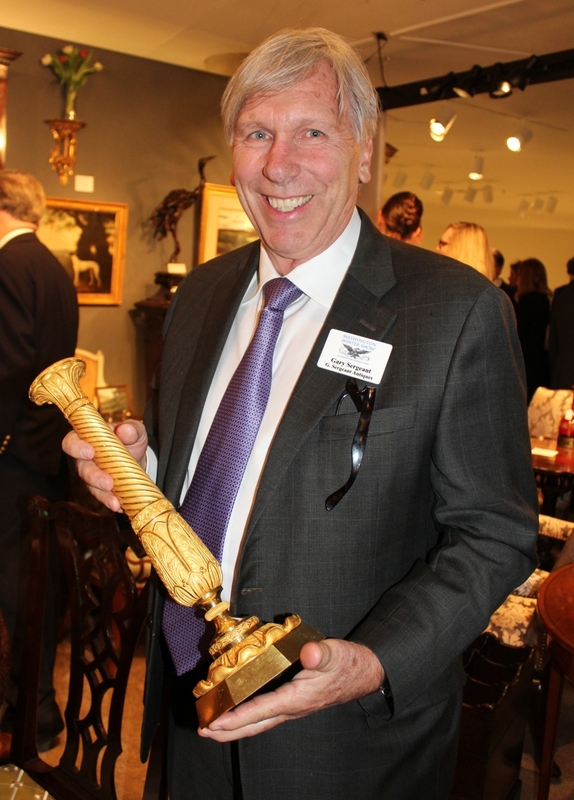 Bev Norwood of The Norwoods’ Spirit of America, Timonium, Md., reported the sale of an early Nineteenth Century portrait of a young woman; a painting of twin girls; two early fire buckets with historical significance; two 1820s schoolgirl theorems; a paint-decorated gameboard; two decoys; and a highly detailed carved walking stick, among other items. 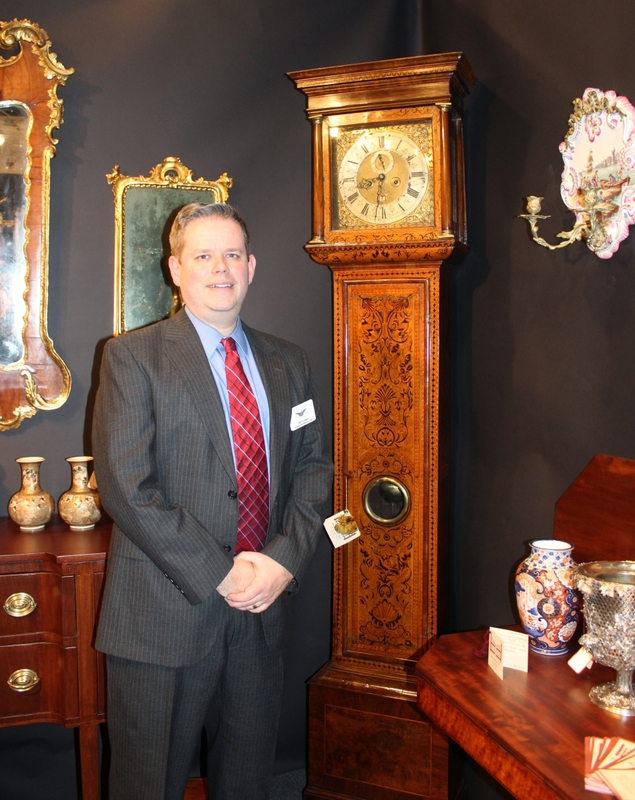 On opening night, Fredericksburg, Va., dealer Bill Beck, Beck’s Antiques, sold a Federal mahogany china press, attributed to the school of Annapolis cabinetmaker, John Shaw, that he had advertised it in the show catalog. Beck said afterwards that they had had a good show, about as good as in previous years, but that it would be their best show ever if a card table that went out on approval ended up selling. He was particularly enthusiastic about an Eighteenth Century Italian redware olive oil jar he sold to Mount Vernon. It is identical to one owned by George Washington that Mount Vernon owns that is in fragile condition; the one Beck sold them will be put out for display. Mark and Marjorie Allen, Weir Beach, N.H., had “reasonable” sales during the first part of the show but said it dropped off once the storm hit. Gary Sergeant, G. Sergeant Antiques, Woodbury, Conn., said he had a moderate show but that the storm hurt him as well. He sold a pair of gilt candlesticks and had interest in several of his major pieces, including a breakfront cabinet and a chest on frame nearly sold. 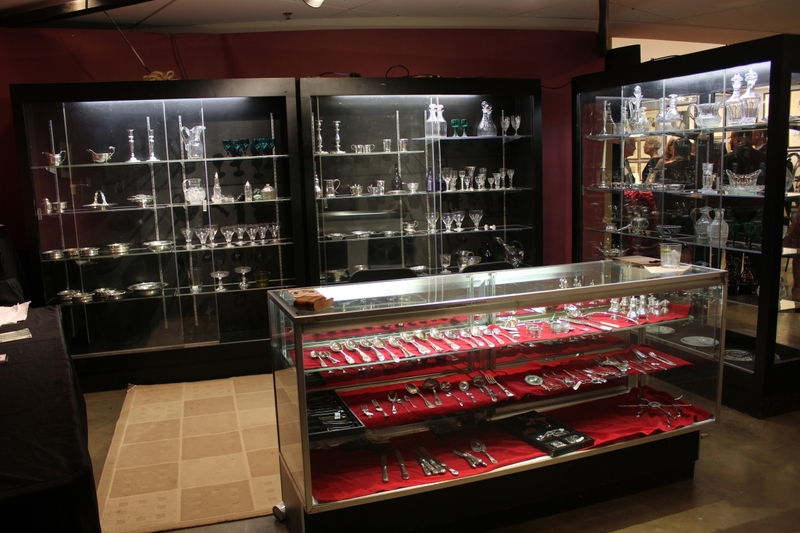 Despite the snow, Bob Haneberg, The Hanebergs Antiques, East Lyme, Conn., said the majority of his sales came on Sunday. Haneberg reported selling a pair of China trade paintings, a set of four Georgian silver candlesticks, another pair of silver candlesticks by the Batemans, miniature furniture, Queen Anne candlesticks and other brass pieces, and several Chinese porcelain pieces, as well as other things. Kevin Rita, Garvey Rita Art & Antiques, Orleans, Mass., said he had done about the same at this show as he has in previous years, selling three paintings and a number of smalls, books and ceramics. Taylor Thistlethwaite sold an early Baltimore chair on opening night and a Civil War sword during the show. He is shown here with a Federal inlaid walnut slant-lid desk from western Maryland that he found in Kentucky. Hanging above the desk is a western Maryland painting done by Gladys Nelson Smith. 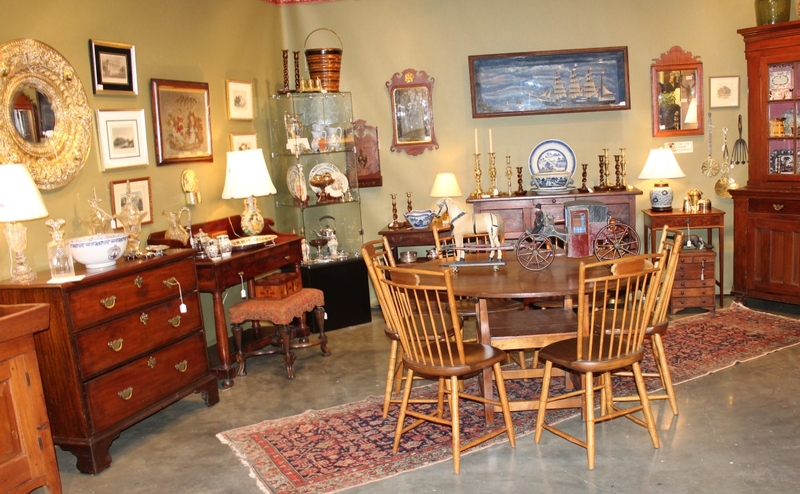 Thistlethwaite Americana, Alexandria, Va. and Glasgow, Ky.
James Kilvington, Greenville, Del., sold three pieces of furniture during the show, among some smaller things. 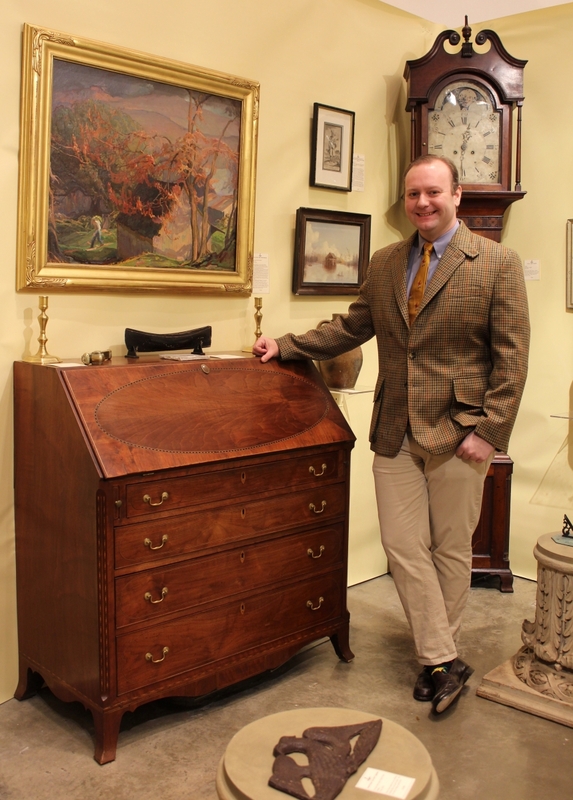 Standing front and center in his booth was an Irish game table with original needlework top that he said had attracted a lot of interest. Situated on the third floor, Roger Winter nonetheless benefitted from the oyster bar that attracted a steady stream of showgoers on opening night. 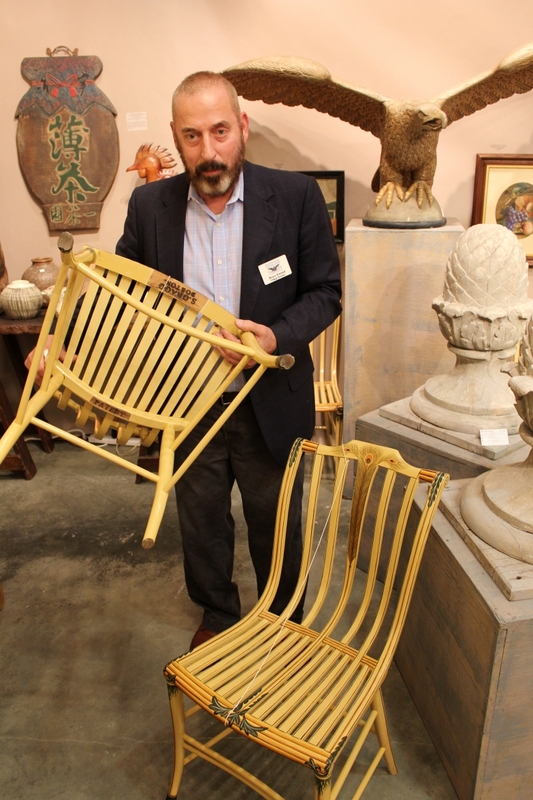 After the show, the Bucks County, Penn., dealer said he had had a good show, selling an octagonal English partners’ desk, a French provincial farm table, a set of ten English country chairs and two oil paintings, among other things. 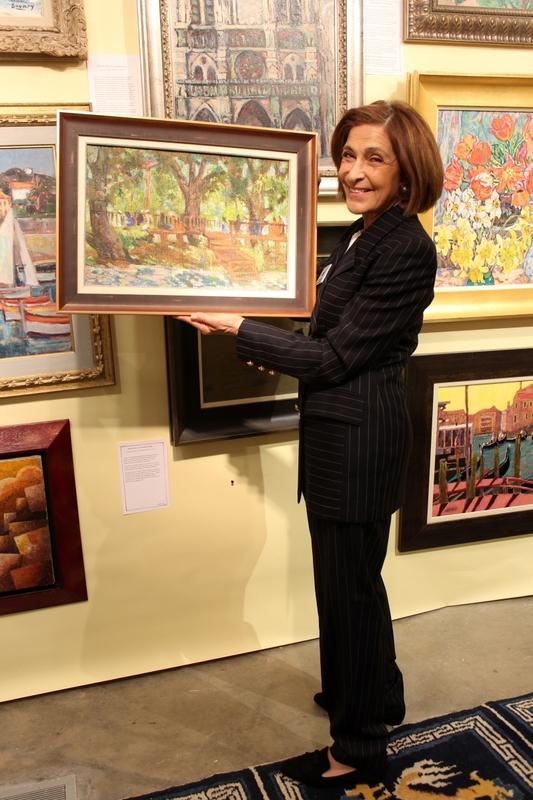 Showing in Washington for 40 years, and with her parents showing earlier than that, Priscilla Boyd Angelos of Boyd’s Antiques is the longest-running dealer at the show. 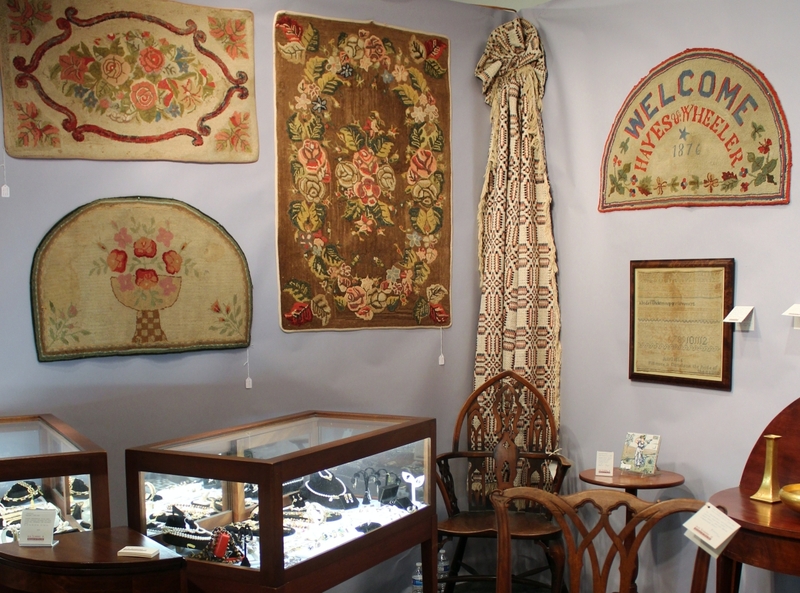 The Flourtown, Penn., dealer said it was a good show for her, with sales across the board, from furniture and wall hangings to porcelains and metals. She complimented the show committee for bringing the right people to the show and is looking forward to coming back in 2020. 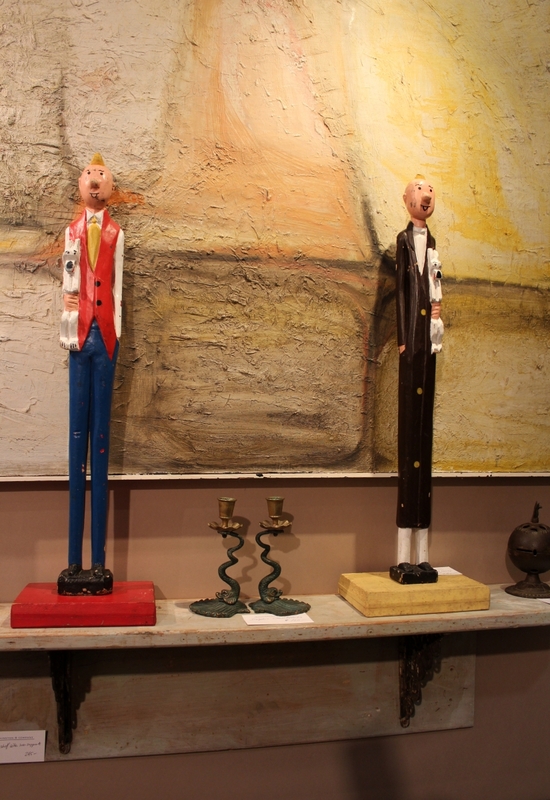 Village Braider’s Bruce Emond reported a good show, selling three pieces of furniture, most of the artwork he had brought, a candelabra and an elaborate porcelain tabletop piece, among other things. While he said the storm hurt the show, he made a sale at the very end of the day on Sunday. 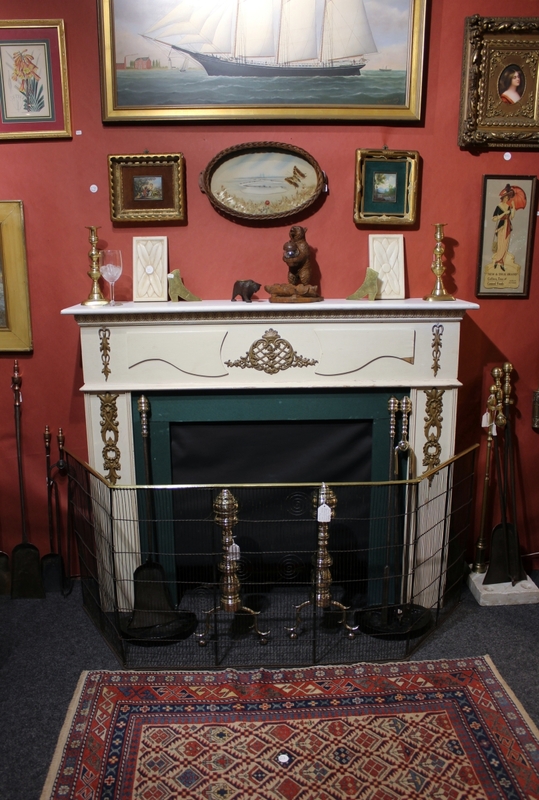 The Plymouth, Mass., dealer said buyers are looking for things that are decorative, whimsical and pragmatic so he is always on the hunt for fresh things that appeal along those lines. Akron, Ohio, dealer Charles E. Puckett said he had a good show. He reported sales in several categories, including three medieval manuscripts with illuminated miniatures, a circa 1700 double sheet navigational chart of the Caribbean, a circa 1760 French map of the Chesapeake region, and a few antiquities including five ancient Roman bronze brooches. 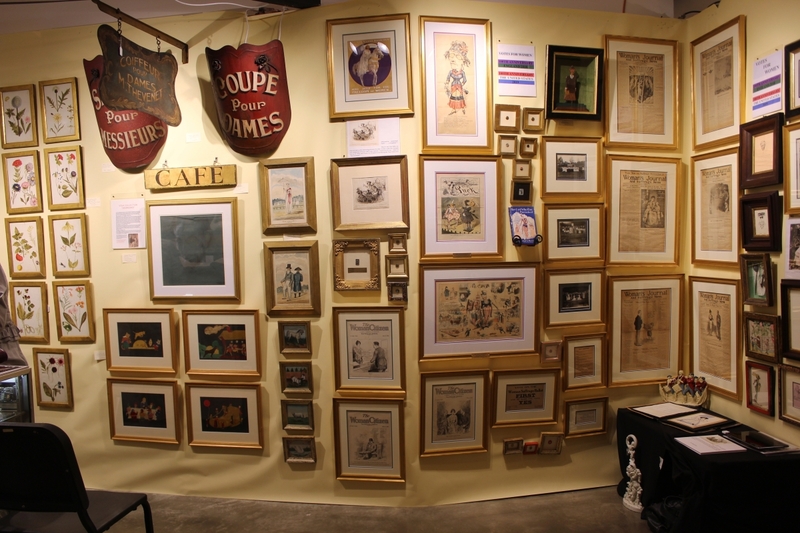 The back wall of Stella Rubin’s booth featured a spectacular 1870s Windmill Blade quilt from the Kroeger family of Baltimore, Md., which Rubin had used in her advertisement in the show catalog. 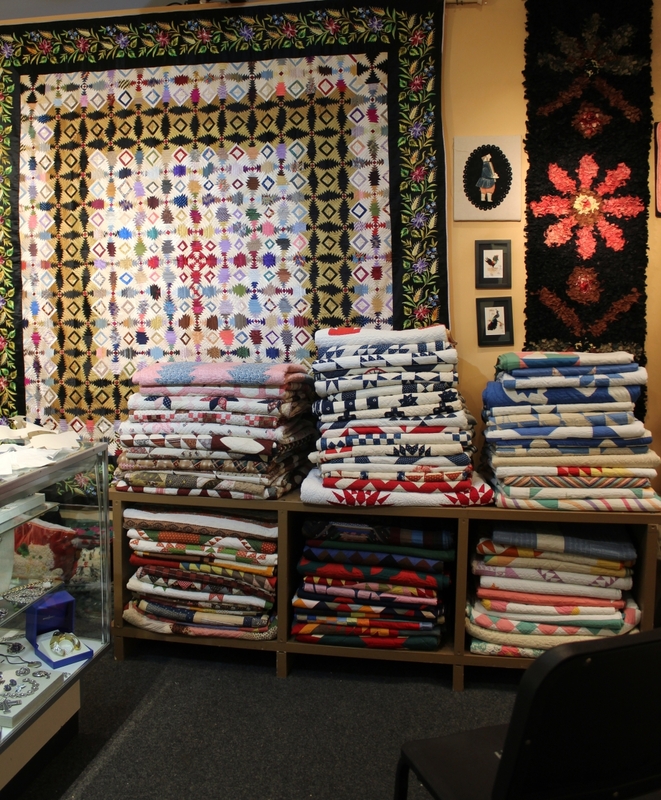 While it did not sell at the show, Rubin reported afterwards that she has promised to lend it to the New England Quilt Museum for a show the museum is opening in April. 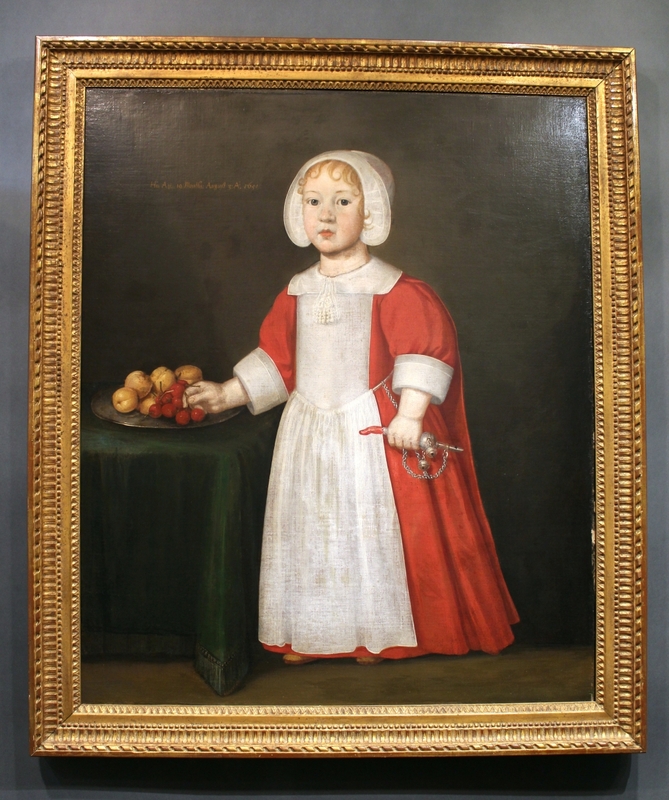 A dramatic mid-Seventeenth Century portrait of a young boy hung in the back of the booth of White Plains, N.Y., dealer Earle D. Vandekar of Knightsbridge. Deidre Healey said they had just acquired it and speaking after the show. Paul Vandekar said it had received a lot of interest. Vandekar said they had made sales during the show and complimented the show on bringing in younger people who would be the “next generation” of buyers. Phyllis Carlson, Carlson and Stevenson, Manchester Center, Vt., brings engraved napkin rings that are often a big hit with buyers and this show was no different with her reporting sales of several throughout the show. 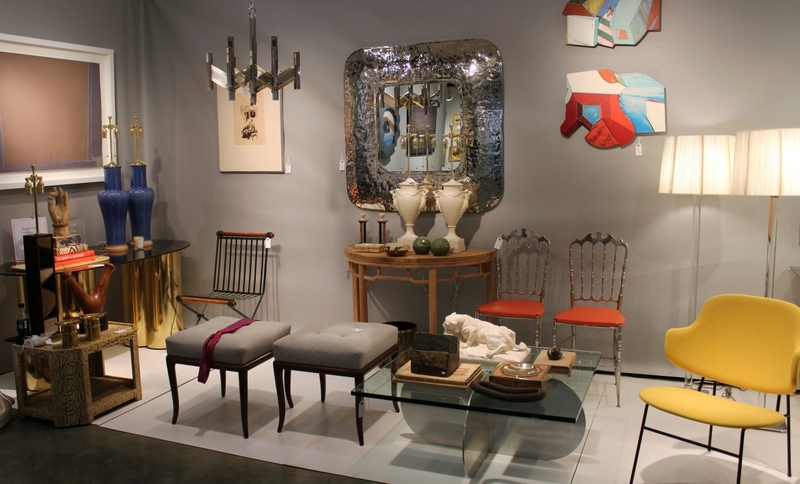 One of the pieces of furniture sold at the show was the octagonal partners’ desk shown in the lower left corner here. Roger D. Winter, Ltd, Bucks County, Penn. Imperial Fine Books and Oriental Art, New York City, sold a pair of Kangxi period blue and white jars and some other pieces, as well as a few leather-bound sets of books. Bibi Mohamed commented that the show was well-attended, the clientele was young and interested in what they had in their booth. 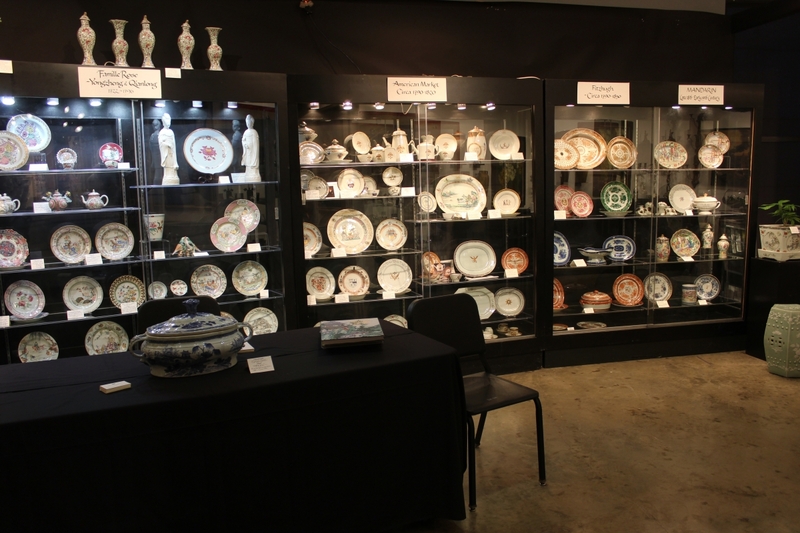 Several furniture dealers bring Asian pottery to the show to sell and Jay Gates, Gates Antiques, Ltd, Midlothian, Va., said they had sold a lot of Japanese and Chinese export, in addition to a few furniture sales. Polly Latham featured a very rare Chinese export famille rose lotus-decorated punch bowl from the late Yongzheng/early Qianlong period, 1735-45 and formerly from the collection of Elinor Gordon in the show catalog. 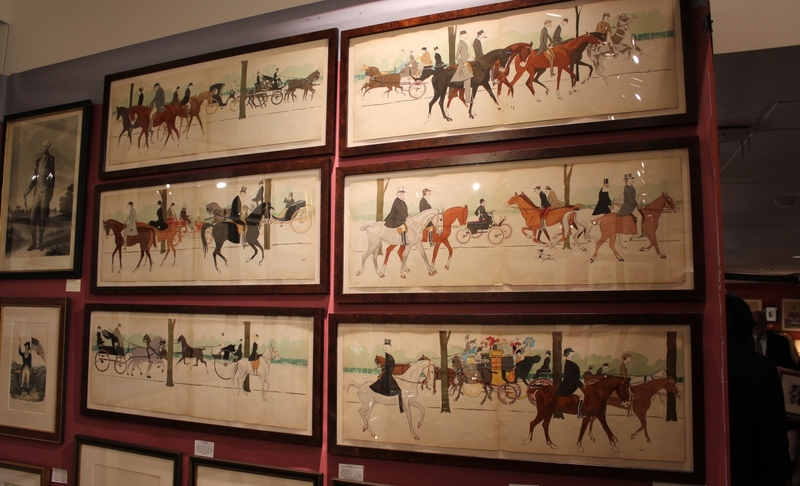 When asked afterwards, the Boston dealer said it received a lot of interest at the show. 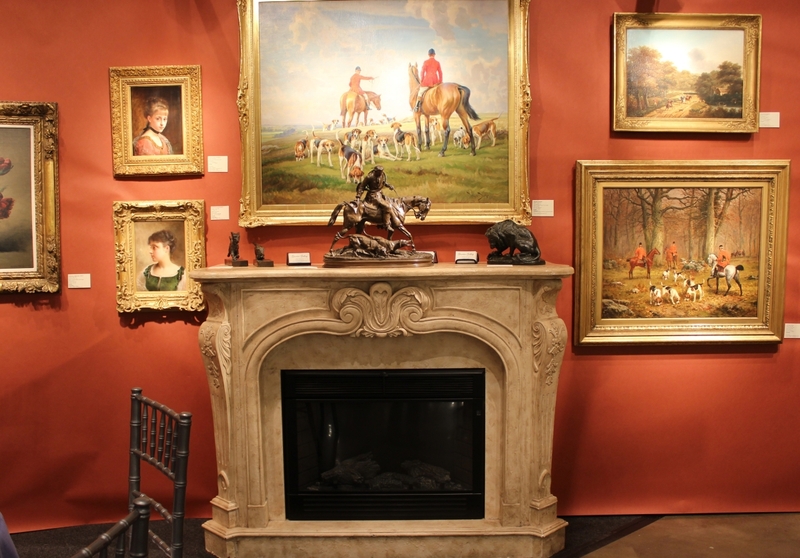 The show attracts several fine art dealers and many reported good sales. Carole Pinto, New York City and Paris, gave a booth talk that attracted nearly a dozen clients. She sold three works, specifically a chromatic painting by French painter Marguerite Bermond, a painting titled “By the Seine” by French impressionist Paul Thomas, who was a colleague of Vincent Van Gogh, and a painting by French artist P.A. Picart Ledoux titled “At the Piano.” Commenting on the show afterwards, Pinto said the curator of prints and drawings at the Smithsonian had been to the show and complimented her on the quality of the selection in her booth. Print sales were strong with D.M. DeLaurentis Fine Antique Prints, and the Philadelphia dealer said people bought botanical engravings, Eighteenth Century bird engravings, a Seventeenth Century Dutch engraving of an elephant, a set of six French Belle Epoque horse caricatures, as well as other different types of prints. To celebrate the centennial of the Nineteenth Amendment and women getting the right to vote, Timothy Stevenson, Carlson and Stevenson, Manchester Center, Vt., had enough suffragette material to fill an entire wall. When asked how the show was for him, Stevenson said the suffragette material had sold very well. Southport, Conn., and Surrey, UK, dealer David Brooker, David Brooker Fine Art, said he had had a great show that he felt had been as busy as previous shows until the snow fell, and that he had sold to a number of new clients as well as a few older clients. A gilt-bronze, lapis lazuli enameled and crystal French honey pot with bee decoration, by Odiot, a replica of one from a service made for Napoleon. 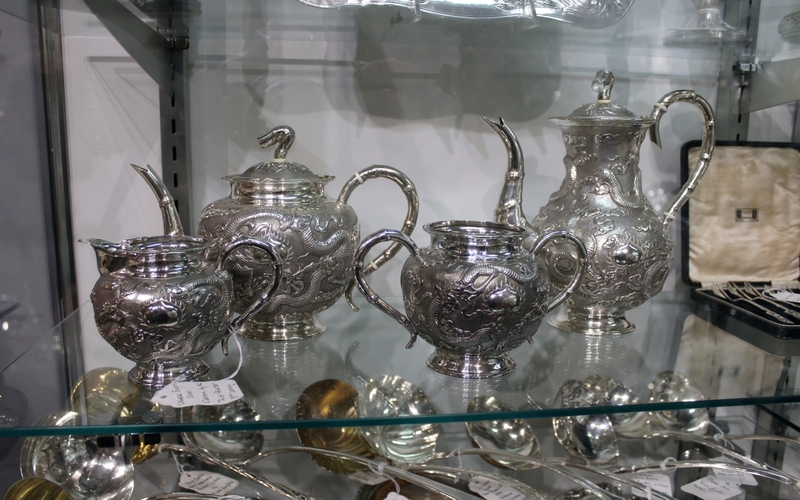 Silver Art by D&R, Baltimore, Md., and Marseille, France. 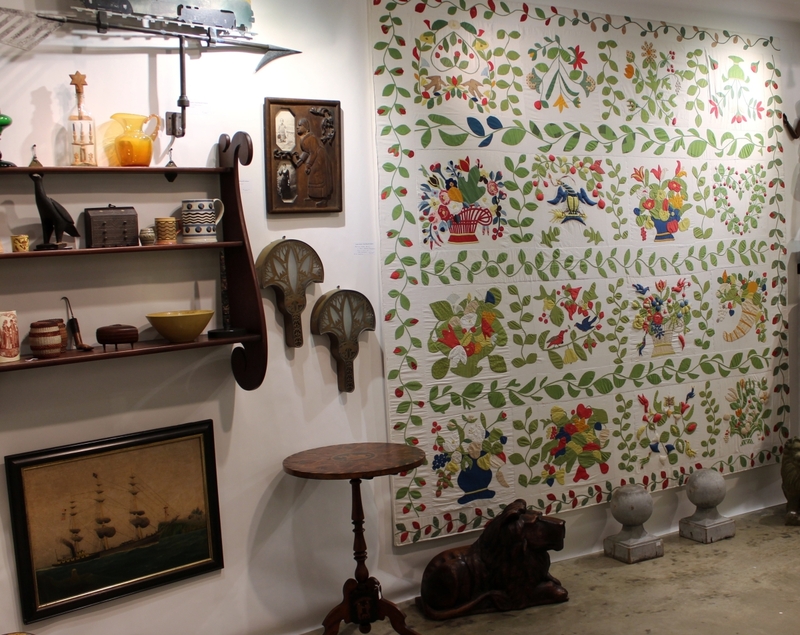 Guarisco Gallery, which is located in the Washington, DC, neighborhood of Georgetown, had decided to do the show to gain visibility among both visitors and local clientele and felt the show had given them good exposure. 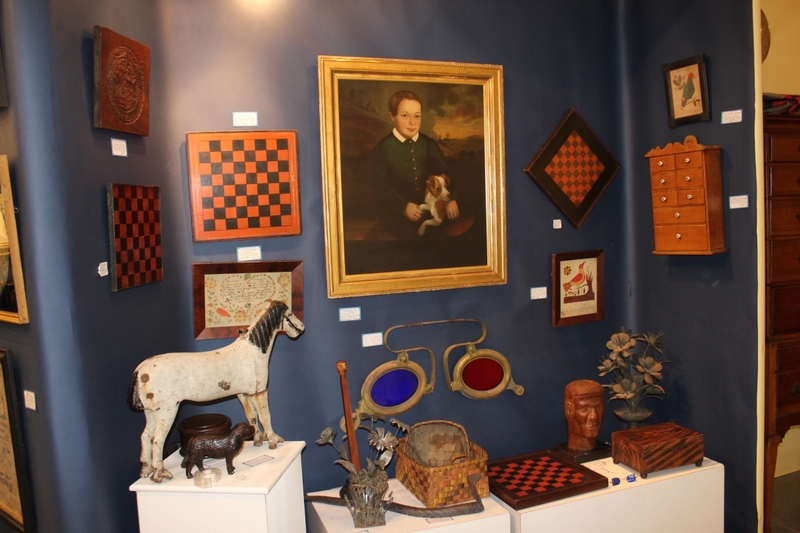 The first-time exhibitor made some sales, was impressed with the attendance on opening night and throughout the show and looks forward to continuing to do the show in the future. The preview party often generates follow up business, with clients returning later in the show to purchase things. Dave White, White’s Nautical Antiques, reported early interest in several things, including a teenager’s primer on learning navigation from 1828 and a William Howard Yorke ship painting. Unfortunately, the weather deterred some clients from returning and the North Yarmouth, Maine, dealer was hopeful he could sell things after the show. 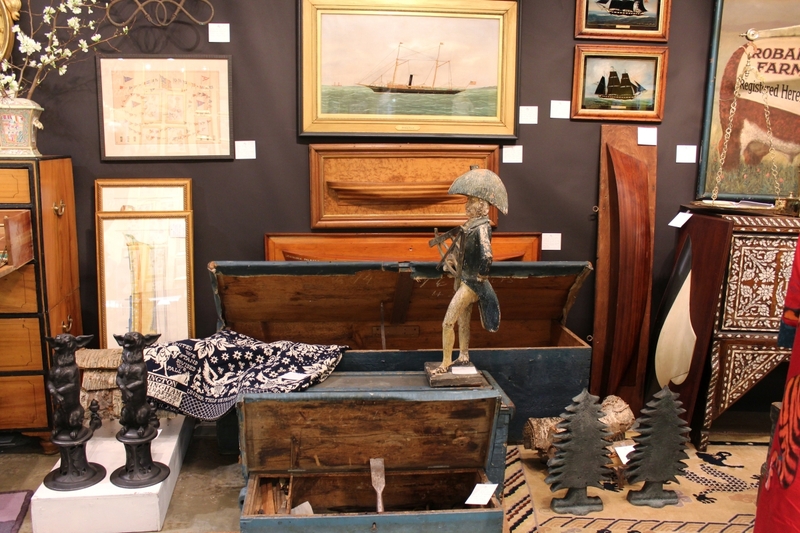 Ann Wilbanks of Find Weatherly, LLC., sold a large antique Syrian inlaid chest, a Nineteenth Century brass Portuguese butcher’s scale, an early Nineteenth Century pair of Chinese export Rose Mandarin bough pots, a Nineteenth Century sailmaker’s work chest full of tools, an antique brass sign with fox hunting whips and a dog hooked rug. First time exhibitor Richard Thorner said the show went “quite well.” The Manchester, Vt., dealer had multiple sales, including a John Trumbull-signed subscription receipt for his Bunker Hill and Death of Montgomery prints made out to John Rutledge, who was the former US Chief Justice and Governor of South Carolina. Thorner also sold a 1798 Edward Savage print of the Washington Family, several Eighteenth Century American bookplates, as well as early maps and other prints. 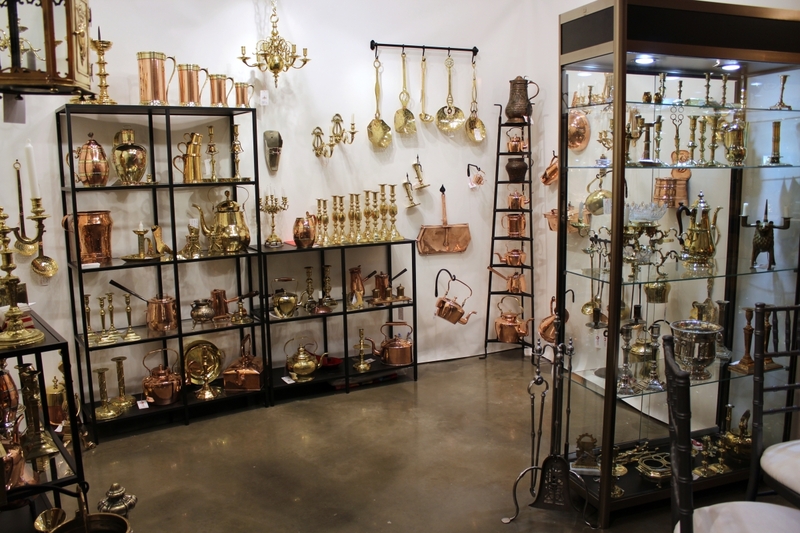 Celebrating its 65th year in 2020, the Washington Winter Show will take place January 10-12. The theme of next year’s show will be “The Face of the Nation” and will focus on George Washington. Winterthur Museum, Garden and Library, Winterthur, Del., will be contributing the loan exhibition. 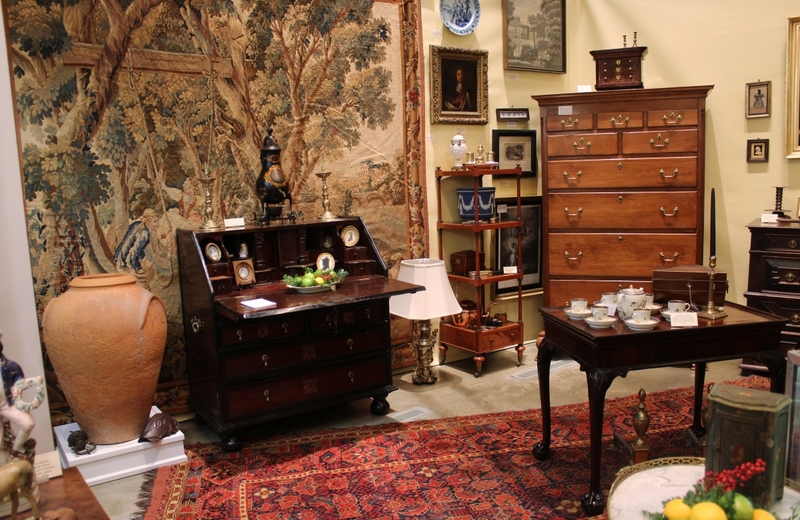 The Washington Winter Antiques Show takes place at the Katzen Art Center, 4400 Massachusetts Ave NW. For information, www.washingtonwintershow.org. Norwoods’ Spirit of America, Timonium, Md.